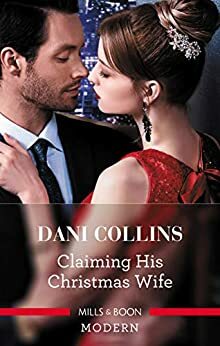 It’s a convenient Christmas arrangement... Until he wants her – forever! After their secret marriage ended in heartbreak, billionaire Travis Sanders never wanted to see Imogen Gantry again. Yet when Imogen faints in the cold New York snow, Travis is called to her very public rescue! To avoid a media scandal, they must agree to a temporary reconciliation – at least until Christmas. But with their intense heat still burning, Travis is tempted to reclaim his wife – for good! Hero was a weak emotional child & a narcissistic jerk; heroine was deeply damaged, weirdly introspective, & needed years of therapy. Even then: after she had years of therapy: he'd never be a decent partner. He *begrudged* loving her, and she would grow far beyond him very quickly. And still: there's no reason whatsoever to believe that these two will stay together. Too much lying & hiding: from their early stupidly-short 3 week marriage (after meeting 1 week before, when she had just turned 20!!! ): to their 4 years later, forced, 8 week fake reconciliation. Then a 2+ week separation/big break up/2 more weeks separation/voila: happily every after! It's just ridiculous: 4 weeks together when she was 20, 8ish weeks forced on her when she was 24 & truly completely desperate, 4+ weeks apart: the first 2 with hope of a continuing relationship, brutally ended by "Hero" at midpoint, then another couple weeks while he talks with his daddy & has an epiphany. Then she falls in to his waiting arms. Ick. Though Ms. Collins is a relatively acceptable HP author, this one stretches credibility far beyond the breaking point. Not worth the money at $3. You could spend 40 minutes re-reading a favorite book & get way more enjoyment from it. Felt like I was reading a book from the 70's in a way. The writing style seemed dated to me but that is me. The hero, Travis was disappointing and almost a jerk sometimes, very hard to understand him as he managed to misread so much and appeared to be very self centered. Imogen had a very sad early life with a jerk for a father who used her even after she worked so hard to save his business. When she married Travis in a whirlwind marriage, he never wanted to take her out and it became the same stifled feeling of her life with the mean father who only wanted one child not two and she was number two. Just could not fall into this book and feel involved somehow. Maybe because I could identify with Imogen in some ways. The book for me was a bit disappointing or not what I expected thus 4 stars. 5.0 out of 5 starsGreat holiday reunion! Reunited ... for Christmas! A story of a short-lived relationship which ended because each one assumed something erroneous about the other ... now back together, even if for a short time, they can't seem to control the passion that was always there. Travis and Imogen were a memorable connection! I was drawn into their story from the start and the drama and scenery kept my attention quite easily. Really enjoyed! After a secret marriage that ended faster than it began four years ago, Travis Sanders never wanted to see his ex again. That doesn't stop him from rushing to her side when he receives a call that she's collapsed in the street in New York. He believes she used him just for what she could get out of him previously, but when scandal threatens, he has no choice but to keep her by his side temporarily. Imogen Gantry is just about at her lowest point when she awakes to find her ex-husband by her hospital bed. A hospital bed she can't begin to afford by the way, so she demands release no matter what's wrong with her. Forced together for a time, they begin to realize each other's side of view from their short union years ago, and feelings begin to re-emerge. Can they make forever out of their reconciliation. I enjoyed reading this book as it reminded me of when I started reading romanced back in the day. Back when my mom used to hand me a Harlequin after she finished one and say "Here this is a good one." The difference in this book and those back then is this is an author that I is a well read author for me and yes I can say I did like this book as well. This Second Chance romance had me scratching my head but also swooning too. This is one of those reads that has you going back and forth in the read. It's a really good read and one that takes place during my favorite time of the year Christmas time! The h was emotionally abused by her father and was at such a low place she couldn't fight against the emotional abuse of her former husband who'd given her every reason but one to walk out on the marriage. This is not a favorite. I'm not sure I it feels like an HEA, wouldn't have believed it possible, except for the epilogue. I guess I like my H's and h's to be less scarred. That's on me. I didn't like the verbal and other punishing abuse dished out by the House, no matter the reason.